With Chrome DevTools our goal is to make your experience as a web developer as productive as possible. In the most recent version of Chrome we've added three major new features that will improve your authoring experience more than ever before. CSS preprocessors like Sass make it easier to organize your CSS, but until now tweaking your styles required switching to another program and refreshing Chrome. CSS preprocessor mapping enables live-editing of these sources directly within the Sources panel. To see it in action, just map the .scss file, then Ctrl-click on a property or value to jump to the variable, mixin or function that defined it. Support for other pre-processors such as Less, Stylus and Compass is in the works. Refer to the improved DevTools css-preprocessor documentation for more details and setup instructions. 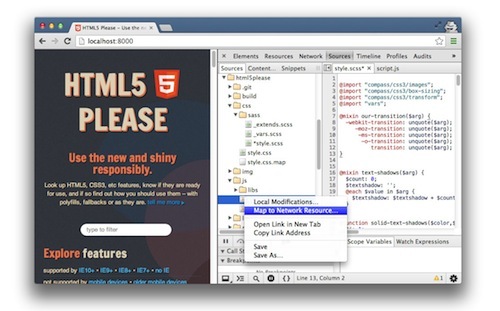 Today’s new features should help make web developers even more productive with DevTools. Please follow us on Google+ at Google Chrome Developers or on Twitter at @ChromiumDev and send feedback at crbug.com. Vsevolod Vlasov is a Software Engineer on the Chrome DevTools team in Saint Petersburg, Russia. His current work focuses on improving web developers authoring workflow.